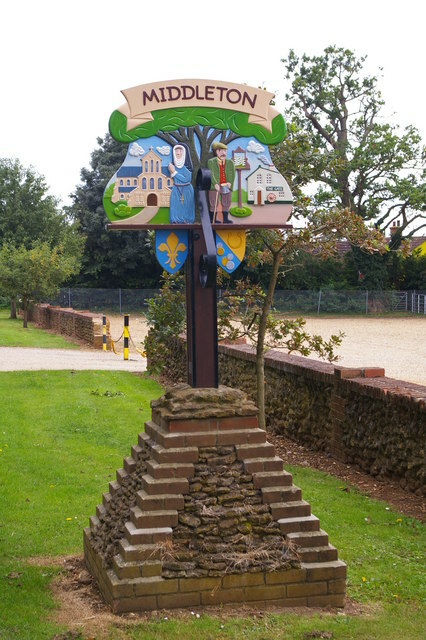 Middleton is the second village on the A47 road to Norwich, after North Runcton. The A47, the main road of Norfolk, runs through the village, and effectively divides the village in two. Fair Green and Blackborough End are both areas of Middleton. Fair Green is on the northern part of the village, whilst Blackborough End is in the southern half of the village. Middleton Castle was a motte and bailey castle built during the Norman period. The motte is 49 m in diameter, protected by an 11 m wide ditch. The castle's crescent-shaped bailey and three rectangular enclosures of uncertain medieval date lay alongside the motte. The castle was built by the Normans on a pre-existing Anglo-Saxon estate centre. On Monday 26 April 2010, bomb disposal experts were called to the village after a dog walker discovered an unexploded grenade in a field behind the primary school. The Ammunition Technician, from the bomb disposal team, said: “We were called to attend the scene following a call from police that an unexploded hand grenade had been discovered. The number 36 Mills grenade was then destroyed by demolition." On 23 November 1944 a Mosquito aircraft which had taken off from nearby Little Snoring airfield crashed into Middleton Fen. Eyewitnesses saw the plane spiralling out of a cloud. It then righted itself before spinning into the ground. Both the pilot and navigator were killed. Mosquito DD736 was piloted by Flying Officer Charles Preece from Hardisty, Alberta, Canada. The navigator was a wartime hero – Flying Officer Frederick Ruffle DFC of 515 squadron. Before the crash Fred had flown over 61 sorties on intruder operations. Most of them with the elite 8 Group pathfinder squadron. He was awarded the Distinguished Flying Cross for the part he played in a succession of bombing raids on the Dortmund–Ems Canal in Germany.